« Two March 2011 classes by Debbie Merion, M.S.W. O f course, becoming a CC (short for Competent Communicator) took much less time than becoming a 50 year old—two years to be exact. The two years it took me to meet the criteria (compose and deliver ten club-evaluated speeches) flew by. At first, I was unaffected by the CC, because I did not join Toastmasters International for the credentials. Don’t get me wrong. I am proud to be a CC, just like I am proud to have other letters after my name, like my B.A and M.S.W. But I originally joined Toastmasters—or “Toastys” as I like to call it—to become a better speaker. Bada boom. That’s all. 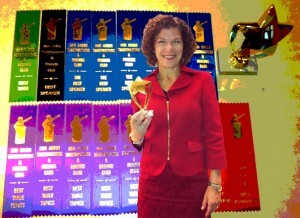 Along the way, I fell in love with Toastmasters and the crazy and creative challenge of speaking. What make a winning speech? I’m still learning the answer to that one. One week I spent 30 hours writing and practicing a complex speech, and the next week prepared a speech just one hour. Interestingly, both were voted best speech in our chapter’s weekly competition. I fell in love with the savvy structure of this 87-year-old organization with 260,000 members. Toastmasters International self-perpetuates by grooming leaders and growing speakers — the leaders run the clubs, and the speakers entertain and educate us at every meeting. I also fell in love with the exceptional people I get together with each week through Toastys. My club members are diverse, supportive, and passionate about their own self-improvement. I can be motivated by rewards, like a rabbit attracted to carrots. Achieving the CC credentials and the ribbons for winning speeches were carrots held just out of reach, and kept me leaving my home and my sweet husband on dark Wednesday nights. The CC, though, is more than a reward. I see the CC as a symbol that perhaps—hopefully—I have improved as a speaker over these two years. And for that, I am very grateful to my Ann Arbor Toastmasters and Friends Club, who, like my mother, delights me by finding me amusing when I am not trying to be, and continues to be unfailingly supportive. Congratulations on completing your CC!